I really like this simple to make potato side dish. Be warned if you’re coming over to my place for dinner in the next little while you’ll be eating potatoes. Winter and potatoes go together very well as far as I’m concerned. 1. Boil, steam or microwave the potatoes until tender. Cool, peel and chop. Heat the oil in a large heavy-based pan over medium heat. Cook the cumin, coriander and mustard seeds for 1 minute, stirring constantly. 2. Add the sesame seeds; cook for 1-2 minutes, stirring until golden. Add the turmeric, chilies, potatoes, lemon rind and juice. Stir until well combined and heated through. Season to taste, with salt and pepper. I love going to the gym as gym means that when I get home it’s time for smoothies! (yes, really everything is about food). This is the smoothie of the hour. 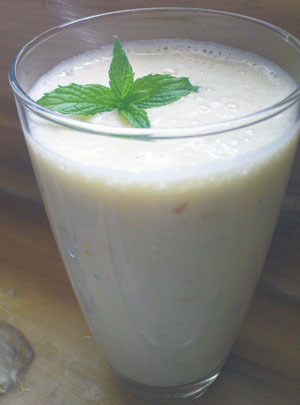 I think it’s the mint leaves and dash of lemon which give this smoothie the edge. Put the following in your blender. Then add milk. For two people I add milk till the total of ingredients in the blender is 750mls. I’m currently not going to the gym as I broke my finger. Damn. I’ll probably make the smoothie again soon anyway though I’ll need to get Thomas to do the chopping for me. 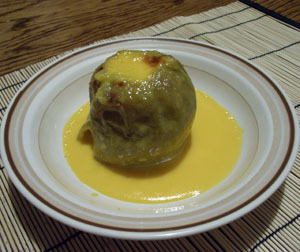 I was reading the Indulgence section of The Dominion Post when a recipe for Crema Catalana Baked Apples caught my eye. I’d just been wondering what to do with the Granny Smith Apples sitting in our fruit bowl! The baked apples were nice, pretty much what you’d expect from baked apples but the Cream Catalana (Spanish Custard) made me roll back my eyes in delight. Grease ovenproof gratin dish generously with butter. Core apples, being careful not to cut through the bottoms. You could use an apple corer, or a small paring knife to carve out a cavity in the centre of the apples about 1cm – 2cm in diameter, and as close to the bottom as you can without piercing it. If necessary cut a tiny sliver of apple from the base to ensure the apple will sit flat. Place apples in gratin, bottom down. 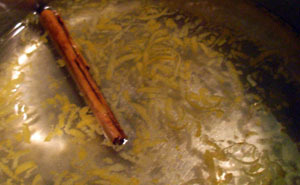 In a small pot set over a low heat, place water, sugar, lemon zest and cinnamon quill and stir to dissolve. Increase heat and bring to the boil. Remove from heat and pour in and over apples. Leave cinnamon quill and zest in the gratin with the apples. Place gratin in the oven and bake uncovered, basting occasionally, for 25-35 minutes till apples are tender and the skin just begins to break. Baking time will depend on the size and ripeness of the apples. Prepare Crema Catalana (below) while waiting for the apples to cook. Remove from oven and leave to sit for about 10 minutes. Tip apples to pour off syrup from the apple cavities into the gratin. 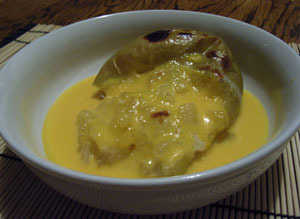 Fill cavity with Crema Catalana (below). Sprinkle with second measure of sugar and, using a chefs torch, brulee till dark brown, or place gratin under a very hot grill till sugar has turned dark brown. Place an apple in each serving plate, drizzle with syrup and accompany with any remaining Crema Catalana. And this is what a slightly overcooked apple looks like. Ooops. In a medium, heavy-based saucepan set over a medium heat, place the cream, milk, cinnamon quill and lemon zest and heat to just below boiling point. Remove from the heat and cool. Place egg yolk in a bowl and lightly whisk till just combined, but not frothy or foamy. Add sugar and combine. Pour cooled cream mixture into the egg mixture and stir to combine, aiming, once again, not to create froth or foam. Wash the cream saucepan and pour the cream/egg mixture into the saucepan and place over low heat. Stir constantly with a wooden spoon till custard thickens and evenly coats the back of the spoon. Strain through a fine sieve to remove the cinnamon quill, zest and remaining particles of egg white. Allow to cool slightly before pouring into the apples. Greek Influenced Scallop Salad with Lemon Dressing. This is a very quick and tasty light meal. I was worried that the olives would overwhelm the dish so I only put a few in. It ended up working well. It had the tartness of the olives, the saltiness of the feta and the sourness of the lemon dressing. If you don’t like olives I suspect capers would be a nice alternative. Chop feta, olives, avocado and add to a bowl with the spinach leaves. Heat the oil in pan to a high temperature. Add garlic and scallops. Don’t cook the scallops too long, as soon as they loose their translucency and turn opaque they’re done. I normally cook until lightly seared on each side, turning once (around 5 mintues cooking). 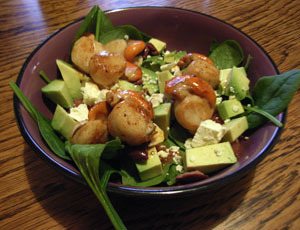 Once the scallops are cooked place on top of the salad. Quickly add some lemon to the remaining oil and garlic, stir for 20 seconds then remove from heat. Pour a little on to the salad as a dressing. I’m not sure if this drink does any good in a medicinal way but it certainly makes me *feel* better when I’ve got a cold, especially if someone else makes it for me. I think it’s partly good for the feeling of being looked after (thanks Thomas!). So if you have anyone with winter colds in your household this recipe is for you. Make them feel loved. Add all ingredients to a cup of boiled water. Warning: I like my lemon drink tart so you may need to reduce the lemon or add more honey! 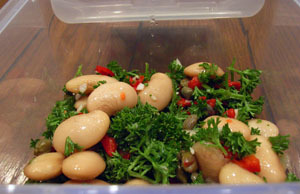 This salad has a strong, tart taste and the chili adds extra lip tingling enjoyment. It’s good as a side-salad. 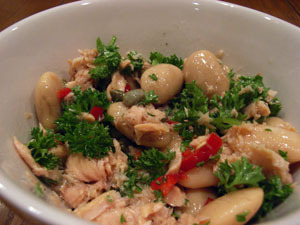 I just added a little canned tuna to bulk it out. Guess what I’m having for lunch tomorrow? 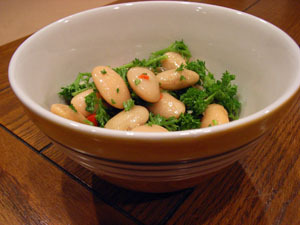 Put it all in a bowl, toss well and let sit at least an hour before serving. Thanks to my friend Jackie for this recipe.